Ramblings of a Daydreamer: SweetMarie83's 400 Follower + Birthday Celebration Giveaway! SweetMarie83's 400 Follower + Birthday Celebration Giveaway! This giveaway will run from today (November 16th) until my birthday on December 16th. I’m letting it run so long because I’m hoping to collect more swag and have an extra winner or two. A book of your choice from the selection below. I’ve got a really random selection of books here. Some are old favorites, some are newer favorites, some are books on my TBR pile or wish list, and I threw in a couple of new-ish releases for good measure. They’re mostly YA, but I added a few adult books so there would hopefully be something for everyone. This giveaway is open internationally as long as The Book Depository ships to your country. Whew! So many entries! I hope I win! Thanks for the giveaway and happy birthday! Not over thanksgiving weekend, but the weekend after my daughter gets to dance in The Nutcracker. Things have just been so busy this fall. Congrats on 400 followers and HAPPY BIRTHDAY!!!!!!! hmm I'm not sure yet which I'd choose, need to do some investigating on a couple lol Great giveaway though thanks and well done on hitting 400! Thanks for the giveaway & happy birthday! First off, happy birthday (even though it's next month)and for Christmas, what I want, is to be able to spend it with my entire family and my 5 month old in FL. Luckily, thats one thing that I'll be getting. YAY...SO EXCITED!! I would choose The Iron Knight by Julie Kagawa. Congrats on the 400+ followers & Happy Birthday in advance!!! thanks for the giveaway!... i would love to win dark mirror :p..
Congratulations on reaching 400 followers! Thanks for the giveaway. This weekend will be a relaxing one for me. Swimming, and reading. How else better can it be? :) I totally need this before my semester starts on Monday. It'll be a busy, busy time for me then. I'd pick Epic Detour by Amy Rogers. I read a good review of it somewhere (can't remember where!) and the synopsis sounds interesting. Congratulations on reaching a new milestone. That is exciting. And it time for your birthday. Happy birthday! Congrats! Thanks for the giveaway! Think I would choose The Hunger Games. If I picked a book, I'd probably pick Falling in Love with English Boys. :) It looks cute! Thanks for this giveaway! I'd probably choose Dark Mirror. I like how I get entries and the chance to make amusing comments in the additional information box for stuff I do anyway. Ok. This weekend I'm going home to visit my family and I'd love to win Iron Knight. :) thanks for intl opening!! You know, its interesting that your birthday is one day before mine. Happy Birthday to you! And congrats on the new book! I'll be watching for the release and tour. Yay! Congratulations on 400+ followers Marie :) it's such a wonderful milestone. If I win, I'd love to read Enthralled or Wondrous Strange..
Congrats for reaching 400+ ppl! Belated Happy birthday! Thanks for the giveaway! Congrats on 400+ followers. 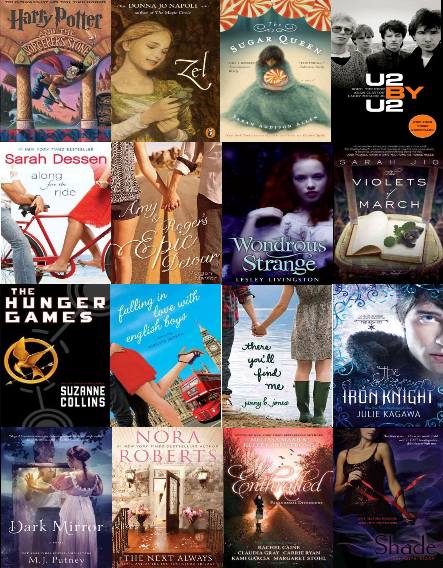 I think i would like the book Enchanted, as I have read a lot of these titles. This week, I am decorating the house for the holidays. My hubby gave me a nook tablet for an early Christmas present, so for Christmas I want lots of gift cards to B&N..hahahaha! Congratz on all of your followers and Happy Birthday. Oh man I am just working working and more work! This is crunch time for me but luckily I'll be going back home to NYC this upcoming weekend. I'll be reading this week as usual, my pile is kind of really big. If I have a wish for christmas it would be to get Clockwork Prince! If I win I would choose The Iron Knight. Thanks for the giveaway! If I win I think I will choose Shade just because the cover is intriguing! But Enthralled and Wondrous Strange will be great too! Thanks again! I just noticed the Twitter one is a daily entry. And to think I missed so many chances to have fun with that. Hi, thank you for doing this wonderful giveaway! Congrats on reaching 400 followers! I'd choose The Hunger Games. If I was so lucky to win, I would choose Dark Mirror. It sounds really good! Violets and March. Looks good. is Dec 10. his Girlfriends is on the 15th. Nice selection of book avail. Would love to snag some sweet swag. Congratulations on having so many followers! I guess for Christmas I really want to go to Italy to see my favorite aunt and uncle. I would also love to read The Iron Knight! congrats!! and thanks for making this international!! Forgot to say, I live in England. Happy Bday (just a little early). For Christmas, I am eating until I cant eat anymore..lol.